A colorful balloonist recently accosted my family as we ate dinner. We were at Applebee’s, led by gift cards from my grandfather and our little secret that we enjoy the restaurant’s kitschy atmosphere and half-price appetizers. The balloonist was walking around sporting a propeller-topped red hat and a balloon filled with rattling beads on his wrist. I hadn’t adequately prepared my 3-year-old to resist such enterprising genius. So she called out to the balloon man, giving him the green light to bother us. He didn’t charge us anything or ask for anything. He offered a gift with a smile and skill. But the button on his thick yellow suspender -- “I work for tips” -- made it clear that he was hoping for something, too. I reached into my wallet and surrendered a dollar. With my daughter gleefully shaking her inflated blue monkey, I said to my wife, “Don’t people know we just want to be left alone?” Yes, that was one of the less-pastoral things I said that day -- and not befitting a native of Minnesota. But it was true. I don’t go out to eat for the balloons. Since that encounter, an existential anxiety has gripped me: I, too, regularly go to restaurants to get noticed. I try to look different. I offer something -- “free prayer” -- that people did not come in for. Am I another suspendered balloonist? A clown with a clergy shirt? Something worse? 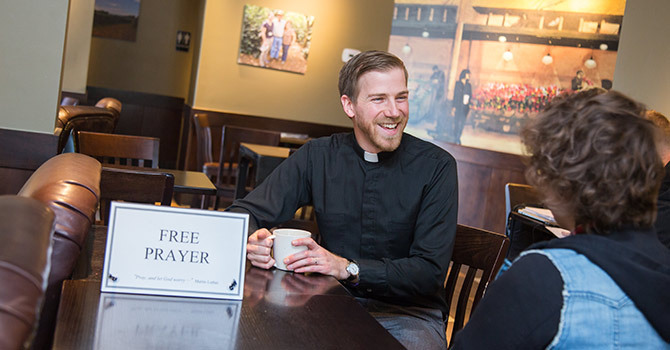 Every week, I show up in restaurants or coffee shops to offer free prayer. Rather than a propeller-topped hat, I sport a clerical collar. Rather than a button inviting tips, I set up a black and white “Free Prayer” sign. And every week, I talk with several strangers about their faith and life. Every pastor, church leader and Christian is called somehow to invite others along the way of Jesus. In our secular age, ministry leaders cannot afford to hunker down in our holy hideouts. We have to be where the people are. But we must do so without being obnoxious. No rattling balloons, no buttons announcing, “I work for tips.” Yes, we have to be noticed, but there is a line between invitation and irritation. My experience with free prayer over the last two years has taught me several features of a welcome invitation. First, I’ve learned to make it easy to say yes. My “Free Prayer” sign invites people, but I make it easier for them to engage by catching their eyes and sharing a smile. I have even begun pushing the chair out on the other side of the table. People no longer have to move it to sit down. The smallest gesture speaks volumes. Without a word, I say, “Yes, I would love for you to sit here.” And that makes it a little easier for strangers to say yes to my invitation. The concept translates. Maybe you’d love to connect your sibling’s family with church. Make it easier for them to say yes to an invitation by giving them another reason to come. You love your kids; so do they. So invite them to your daughter’s baptism or to hear her sing in the choir. I have also learned through free prayer not to wear out my welcome. I don’t go to the same place every week but rotate among several shops. I set up where I can be noticed, but not right in front of the register. I don’t raid people’s tables; I let them come to me. The balloon man bugged me not because he was there but because he rattled his balloon right in front of my daughter. Just let me come to you, balloon man. Again, the concept translates. Proselytizing friends at dinner is irritating; weaving sermon insights into conversation is inviting. With a gentle approach, you’ll never have to eat alone -- you’ll dine another day with friends and have the chance to share another invitation. Jesus regularly sat with strangers and shared a meal. Jesus enjoyed eating, drinking and being social. He was authentic. And authenticity rarely irritates. To decide how you can go public as a Christian, consider where you are most authentic, most yourself, and then add a thoughtful invitation to the mix. Maybe you enjoy craft beer. How could you let people know about a guy who turned water into wine? Maybe you like to garden. How could a bountiful harvest tastefully witness to one who fed the hungry? As the 21st-century church, we must learn how to be inviting without being irritating. I assume the balloon man asked permission to be in Applebee’s. It’s anyone’s guess what manager thought it was a good idea to let him roam free. As Christians, we have all the permission we need to be out in the world pointing people to Jesus. God gave us the green light when God commanded us to “go.” The right invitation gets results. Make it easy for people to say yes. Don’t wear out your welcome. Be yourself. Just promise you’ll let me finish my dinner if you decide to use balloons. Interested in the Free Prayer ministry or have a creative idea for being inviting but not irritating? Go to https://1freeprayer.org/ or email the author at trusert@doylestownlutheran.org.